TAVES 2013 marks the fifth show to choose Enjoy the Music.com as official media partners. (September 16, 2013) Enjoy the Music.com and the Toronto Audio Video Entertainment Show, the area's largest electronics show, have joined forces to offer worldwide coverage of TAVES 2013. This new agreement brings to a total of five events and seven publications to partner with Enjoy the Music.com. Millions of online audio and video enthusiasts will enjoy extensive coverage of this important Canadian event. Both major manufacturers and niche companies will fill the King Edward Hotel in downtown Toronto from November 1st through 3rd; with attendance expected to surpass their impressive 2012 event. "We are delighted to work together with Enjoy the Music.com to help more consumers discover the joy of listening to music on a high quality audio system," says Suave Kajko, president of the Toronto Audio Video Entertainment Show (TAVES). "Both Enjoy the Music.com and TAVES share a common goal — to inform consumers about the latest audio components and technology developments, while promoting good buying decisions. As the name implies, TAVES also places a big focus on home theatre equipment as well as educational seminars. We are aware that plenty of Canadians read Enjoy the Music.com and hope that most of them will came out to experience TAVES this year. Likewise, through this partnership TAVES hopes to introduce many new readers to Enjoy the Music.com." "Once again the high fidelity audio industry has chosen longstanding and prominent site Enjoy the Music.com as official media sponsors," says Editor and Creative Director Steven R. Rochlin of Enjoy the Music.com. 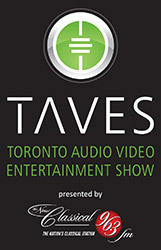 "TAVES is the largest audio/video show in Toronto, with 2013 celebrating their third year in providing attendees an excellent and rewarding experience. For those who love music in their home and on the go, there will be something for everyone at TAVES 2013. We are delighted to bring millions of online readers the opportunity to see and learn of the many great products available today. Many exciting and cutting-edge products will be featured within our exclusive TAVES 2013 coverage. As with the seven publications and four other events that have partnered with Enjoy the Music.com, this new alliance continues our ongoing expansion in providing significant information to our extensive worldwide audience." If you're a music or movie buff, the Toronto Audio Video Entertainment Show (TAVES), presented by The New Classical 96.3 FM and Import Hifi, promises to be your ultimate playground. But don't be mistaken, TAVES isn't only for audio/video enthusiasts, it caters to a much more diverse audience. Whether you're thinking of setting up your very first home theatre system in the living room, upgrading from a basic home theatre system to something better, or even setting up a two-channel system just for music, TAVES is the definitive place to research and experience demonstrations of cutting edge audio and video gear available today. In addition to two-channel music rooms, this year TAVES will feature the largest number of home theatre demonstration to date. Other interesting product categories include cutting edge TV sets, headphones/earphones, high-quality wireless speakers capable of streaming music from your smartphone/tablet, as well as multi-room audio systems. Of course there will also be an abundance of products to purchase at the show such as audio and video cables, headphones, earphones, CDs, records, concert Blu-rays and much more. Now in it's third year, TAVES 2013 will be held between November 1st through 3rd at the King Edward Hotel in downtown Toronto. To learn more and purchase show ticket, please see www.TaveShow.com. Enjoy the Music.com is the Internet's leading information site for high fidelity audio information, reviews and show reports including home and mobile devices, digital music downloads and more since 1995. The site has received critical acclaim from worldwide Web surfers, like-minded audio publications plus the President of the Consumer Electronics Association. Being affiliated with seven prominent print publications, plus offering its own Review Magazine and over 135 show reports online, Enjoy the Music.com is the leading Internet authority for diverse information serving both audiophiles and music lovers worldwide. Enjoy the Music.com is media sponsors of AXPONA, The NY Audio Show, TAVES, T.H.E. Show Newport Beach and the RMAF events. Enjoy the Music.com is the only specialty audio site with its own Internet browser, RSS feed, Android and Windows Phone 7 and Windows 8 applications so their readership can easily find information they desire. Readers can find us on all leading social media sites such as Twitter, Facebook, and Pinterest. Enjoy the Music.com is official Internet partners with The Absolute Sound, hi-fi+, Hi-Fi Media, Hi-Fi World, HIFICRITIC, Sound Practices and VALVE magazine. Those desiring an interview with Editor and Creative Director Steven R. Rochlin can e-mail their request by clicking here.